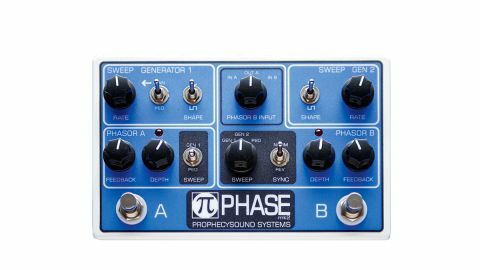 The ultimate analogue phaser reborn; cheaper than a vintage unit without the maintenance! Prophecysound Systems' pedal aims to be an accurate recreation of the Mu-Tron Bi-Phase by using as many of the same components as the original. While it's much smaller, it manages to provide the same control layout, ergonomically laid out for a logical workflow. The two individually switchable phasers can be used separately or combined for mono (series) or stereo operation. Each phaser has Rate, Depth and Feedback knobs and the option of sine or square wave modulation for its own sweep-generating LFO. If you don't want two phasers running together at different speeds, a single LFO can be used to synchronise the sweeps of both. A standard expression pedal can be used to alter the sweep rate of the first LFO or to manually sweep either phaser, wah-style. All that control makes for an incredibly nuanced range of excellent-quality phasing sounds.